From my Vespa's parking place to the upper right corner of this photo, taken at Camp Ellis, Maine's longest stretch of sandy beaches runs for seven miles. 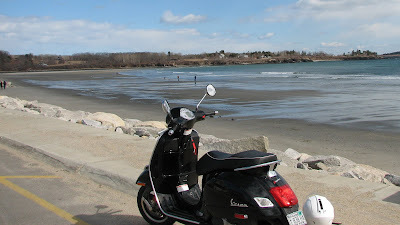 Remember this picture; when I return in midsummer, there will not be a place to park a scooter, or room to plant an umbrella, near any of Maine's beaches. Higgin's Beach in Scarborough is the most popular surfing site in Maine. And when the temperature rises above 60 degrees - which it does for several days every summer - this beautiful stretch of sand just south of Portland will resemble a Woodstock concert crowd. 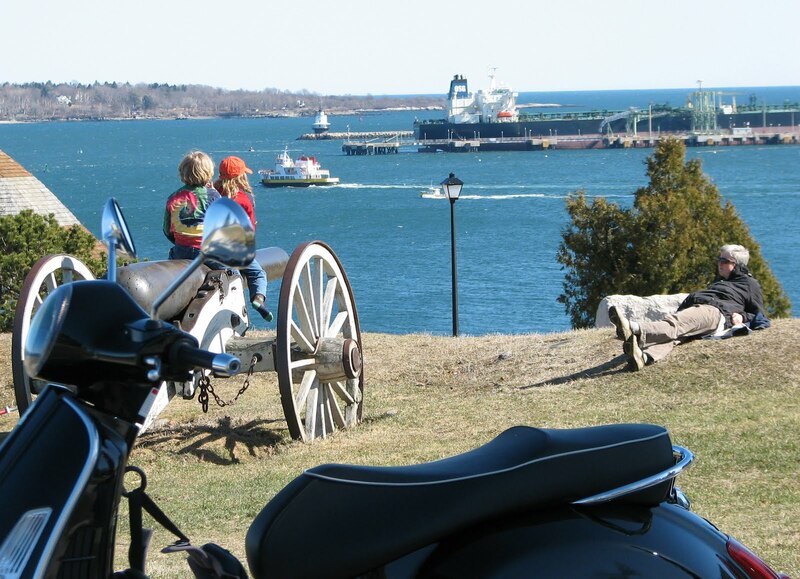 A couple of kids sit on a Civil War cannon at Fort Allen Park in Portland, as Dad relaxes. 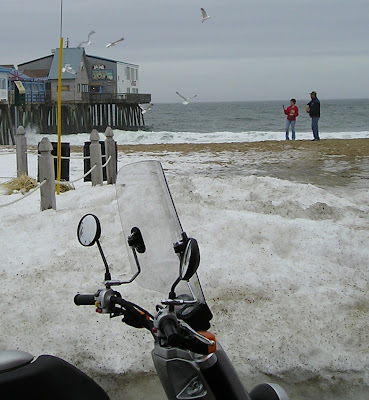 In a late March photo, Old Orchard Beach seagulls are being fed French fries from the only restaurant open before the tourists pour in, and the scavenger gulls enjoy a summer-long buffet. Good to know the weather is warming and you are out and about on the Vespa. It wasn't so long ago that Kim and I were standing on that exact spot at Orchard Beach in a pouring rain. Got some good pictures that day. Would have been much better if a scooter was involved.